While it was once a mobile game, the PS4 version has been altered to be an experience you buy once, so there are no microtransactions to be found here. As the guardian of a tiny planet, will you lose hours of your life to this addictive RPG life simulator, or should you flee this planet at once? Let’s find out. Deiland does have a story, but it takes a backseat to the majority of your time in the game. You play as Arco, a young child who lives on the smallest planet in the universe known as Deiland. While Arco doesn’t know much beyond the boundaries of his planet, he is soon visited by different characters who all have their own stories and quests to offer. The characters themselves are unique enough, and Deiland itself begins to reveal its secrets as time goes on, but the story isn’t present enough to be a major part of the experience. That being said, the allure and mystery behind some of the events and characters are enough to keep you interested in where it’s all going. I would have liked to see more development across the characters and world, but the game’s focus is primarily on the wide range of mechanics it offers to the player. In Deiland, you’ll take on the role of a farmer, fisherman, scientist, mage, miner, and several more. The game has a wide selection of mechanics that allow you to interact with the world. Whether it’s planting trees, breaking apart rocks for stone and minerals, or cooking recipes in your kitchen, you’ll find plenty of things to keep you busy. As visitors come to your planet, you’ll have the opportunity to buy and sell items with them. They will also provide quests for you to do. I liked this a lot because it added some variety to the standard daily routine of farming, mining, and planting trees. The problem here, however, is that you have no reliable way of knowing when a specific character will come back. Let's say you finished a quest for the traveling alien chef character, and you want to turn it in. Well, you’re just gonna have to wait until he comes back. It could be a few minutes, or it could be another hour of gameplay, it’s hard to say. This could have been remedied by having a mechanic that allows you to “call” them essentially. Some sort of communication that let you summon these characters would have streamlined the quests a lot. 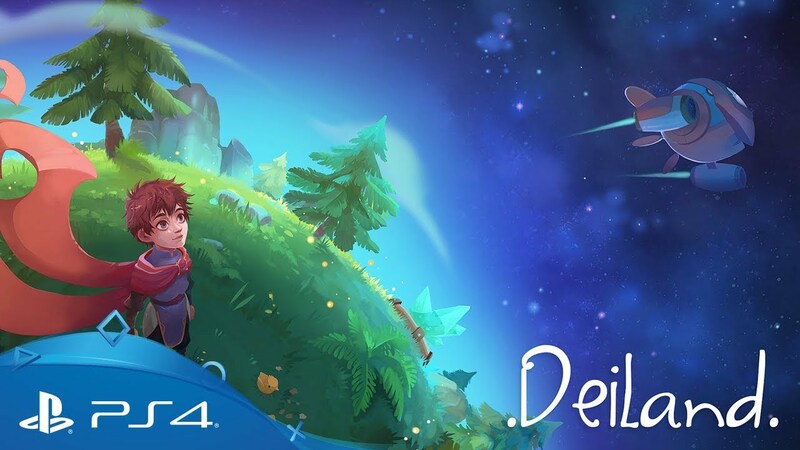 Speaking of waiting, Deiland is very much the PS4 port of a mobile game. In traditional mobile fashion, there are timers on things like crops and trees that prevent you from harvesting them or getting seeds. This is fine, but the timers can be a little long. There is an option to build wells and water crops to reduce timers. You can also rotate the small planet during rainstorms to bring water to your crops. While this helps, there’s just too long of a wait for things to happen and it drags on the game’s pacing. This is further aggravated by the grind-focused nature of the game’s progression. I’m all for working to progress my skills, but Deiland asks a little too much of the player for simple crafting materials like metal ore. While you can mine any rock on the planet’s surface or in the mines you build eventually, it takes a lot of rocks to find a single piece of metal. When some recipes or building upgrades require 30+ metal, you can easily spend a week in-game trying to get this one piece. Meanwhile, you have 800+ pieces of stone you don’t know what to do with. Now, it’s true that these things do get easier as you upgrade your tools and find new methods of acquiring your materials, but the journey to this point is a long and brutal uphill climb. Since you have a set amount of stamina each day, and a hunger meter to keep in check, you’ll need to return home to eat, cook, and sleep a lot. Some of the mechanics, like fishing, also feel half-baked and needlessly difficult. A perfect example is that you need bait to fish, and the button to actually catch the finish changes each time despite the fact that catching the fish is also a reflex-based action. It’s just too many conflicting challenges in one mechanic. If you fail, you also lose your bait, which isn’t easy to come by. Combat is pretty simplistic, but it does gain some depth later in the story. I don’t want to spoil too much on this because the mystery of it all is one of Deiland’s best qualities. All of this of also combined into one tiny planet that you can walk around within the span of a minute, so travel at least is not an issue. Despite the slow progression, however, I couldn’t pull myself away from Deiland. There’s a core gameplay loop here that’s very smart, it’s just out of balance in several ways. Deiland is a beautiful game on a big HD screen. The color palette is vibrant and varied, while the unique rotating perspective of the small planet makes getting around simple and easy. There’s no voice acting to speak of, but the character portraits do a good job of conveying some emotion and personality. Some changes to the design and balancing could have turned Deiland into a standout game, but as it stands the experience is dragged down somewhat by the slow progression and a few half-baked mechanics. Even so, despite these things, I found it hard to pull myself away from this tiny little planet.